Before performing with Cale, Clapton said: "This is the realization of what may have been my last ambition: to work with the man whose music has inspired me for as long as I can remember." Clapton’s touring band at the time included guitarists Doyle Bramhall II and Derek Trucks, keyboardists Chris Stainton and Tim Carmon, bassist Willie Weeks, drummer Steve Jordan and backing vocalists Michelle John and Sharon White. Opener Robert Cray joined the lineup for the encore of the blues standard, "Crossroads." 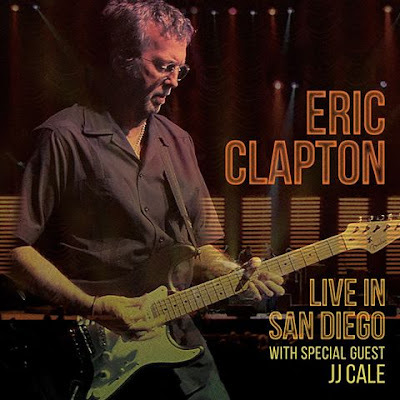 “Live In San Diego with Special Guest JJ Cale” will be available as a two-disc CD, a three-disc vinyl set and as a digital album. Although filmed and recorded, a DVD/Blu-ray release of the concert is not planned. The project sees Clapton reunite with “Slowhand” producer Glyn Johns on the 40th anniversary of the 1976 project that remains one of the guitarist’s biggest-selling studio efforts. “I Still Do” follows the 2014 chart-topping collaborative album, “Eric Clapton & Friends: The Breeze, An Appreciation of JJ Cale”, which saw the guitarist work with Tom Petty, Mark Knopfler, John Mayer, Willie Nelson and others. Cale passed away from a heart attack in La Jolla, California on July 26, 2013 at the age of 74. "Live In San Diego With Special Guest JJ Cale"